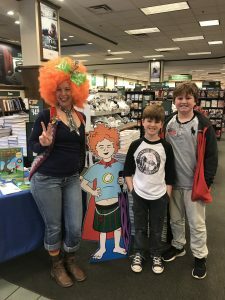 Your friendly neighborhood environmental superhero Daniel and his mum Daniela brought the sunshine into the Barnes & Noble store in Tyler, TX on a recent rainy Sunday. Young readers were delighted to learn about reforestation and excited to think about growing Redwood trees in East Texas from the tree seeds they took home. Daniel invited young gardeners to take pictures of their tree planting projects and send them to us for posting on this website. We’re creating a map of trees planted by our readers and we aim to have a tree planted for every book sold, either by readers or by Daniela & Daniel! Daniel’s tree seed giveaways at Barnes & Noble included Coastal Redwoods, American Elms and Giant Sequoias. Special thanks to a young fan named Jensen in Oklahoma who used to “hate to read” but loves our book (and Daniel’s rocket ship shirt). “You’re now his favorite author,” said Jensen’s uncle. I hope you like the buttons and tree seeds that your uncle got for you. You made my day!